She Lost Her Son to Cancer. Now, This Artist Is Helping Patients Express Themselves. 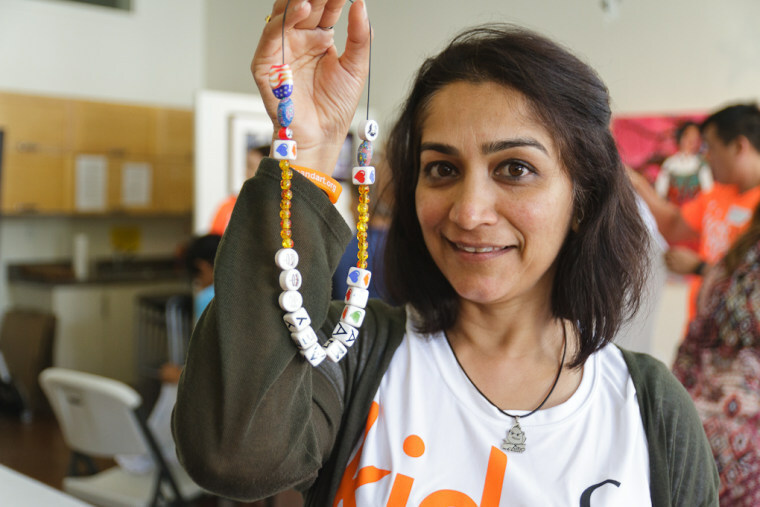 PALO ALTO, Calif. — Twelve years ago, Purvi Shah’s 3-year-old son Amaey was diagnosed with acute myelogenous leukemia, a cancer that affects blood cell production. Word spread about her waiting-room projects, and Shah’s informal art therapy sessions have since grown into the nonprofit Kids & Art Foundation, which hosts weekly art workshops at the University of California, San Francisco and Stanford University hospitals, as well as monthly events at places such as Pixar and Google headquarters, Whole Foods, and local art centers. In total, more than 6,000 children and caretakers have participated over the past nine years, learning how to paint, do photography, make comic books, and repurpose fashion, according to Shah. The American Cancer Society estimates that approximately 10,000 children under the age of 15 were diagnosed with cancer in 2016, with the childhood cancer rate rising slightly over the past few decades. Some of the creations of Kids & Art participants have been auctioned off to raise funds to keep the programs free and contribute to other causes. Between donor fundraising and foundation support, Shah said Kids & Art has raised more than $68,000 in 2016 alone. Children who participate in the workshops — both cancer patients and their siblings — may find an outlet to express emotions they otherwise wouldn't understand. At a September event at the Pacific Arts League — a community gallery in Palo Alto, California, that hosted the nonprofit for Childhood Cancer Awareness Month — 20 local artists worked one-on-one with children, teaching them how to paint, sew, and make clay sculptures among other projects. One of the participants was 10-year-old Suri, who was diagnosed with a brain tumor when she was 3, according to her mother, Ying Zhu. “At that time, the only thing she would do after she came out of the patient room was go to the kids' room to do art,” Zhu said. When the mother learned about Kids & Art earlier this year, she started bringing Suri, along with her 4-year-old sister, to the group’s events. “I think the power of art is really amazing sometimes. It especially helps her release the stress,” Zhu said. Shah said that cancer treatment can be so intensely focused on combating physical ailments, that social and emotional well-being can be overlooked. “A larger conversation about the whole child in treatment needs to happen, rather than just the diagnosis or the cure. It’s a process,” she said. According to a 2006 research review published in the medical journal Cancer, support groups can improve psychological well-being in childhood cancer patients. Other research has also found that the siblings and parents of cancer patients can benefit from "psychosocial support," which includes mental health counseling, education, and group support. Shah noted that it’s especially necessary for Asian-American families to have a place to talk about the stress of cancer. While many of the children are in remission, not every story of cancer treatment has a happy ending. Raaif’s older sister passed away when he was only 5 years old. Shah understands this pain well. In September 2011, her son Amaey passed away at the age of 9. She remains committed to raising awareness and helping families through the process of treating cancer, no matter the outcome. "It's what they get out of it that really matters,” Shah said.